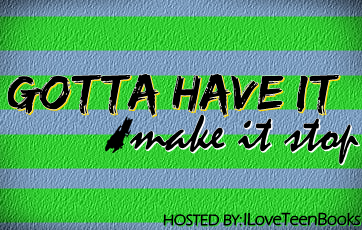 Introducing A New Meme: Gotta Have It/Make It Stop! I know that there are a lot of memes out there in the blog community. I participate in few of them, and they are kind of awesome,because they connect bloggers and give you visitors. That is why I've come up with an (i think it's) original meme. GOTTA HAVE IT/MAKE IT STOP! You are all asking right now, what the hell is this poor guy talking about? Nobody would join in a meme with that kind of name. Well, I hope I could change your minds. Here's what the meme is all about. There are a lot of trends in the YA literature. Some that we love to hate like Love Triangles, and some that we hate that we love so much. That is why, one day of the week, I ( and I hope some of you) will join me to talk about them. Do we like them? Do we hate them? Do we want them to stay? Or we want them to stop? That is what this meme is about. Every Friday, there will be a new trend that we will be discussing.You will have to visit the blog and find out what the topic is that week, post your opinion on it on your blog, and leave a link so that other bloggers can read it. Does it sound fun enough to join? Leave a comment telling me what you think! I will definitely join in when I have the time. It sounds like fun! Loving your idea, I will eventually participate if I have the time. Good job with the blog! Great idea!! Ill hopefully participate next week!! This really sounds good but I already host enough memes. So maybe I'll join one day. I love the sound of this meme. It is completely different from the popular meme's out there today, and I really hope that it sticks around. And I absolutely LOVE to HATE love triangles. What I can love right now is more smart protags. Tough gals and guys, smart and sassy, loving and caring. NOT WHINY! love it :) . I sort of have a love/hate relationship with some trends in the YA literature . Sounds quite interesting! I don't usually participate in memes, but I like to read comments by others. This sounds pretty cool! Awesome meme!! This could be a really good meme...I can see myself checking it out! Great idea! Can't wait to read your posts! Looks super cool. Love the idea. I love it! Sounds fun. Love the sound of it. I'd definitely participate.